missed approach procedures and limitations. Check the required aircraft approach aids before takeoff. Know the minimums for the approach category of the aircraft being flown. 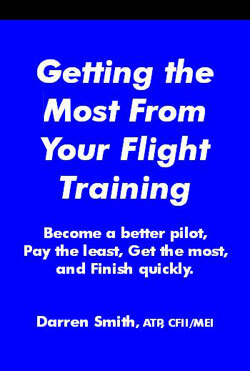 Establish your own personal approach minimums based on recent instrument flight experience and familiarity with the aircraft and equipment to be used. Yovr personal minimums may be higher than published approach minimvms, but cannot be less. Fly the instrument approach procedure as published. Plan an orderly descent to reoch the Minimvm Descent Altitude prior to the Missed Approach Point. Maintoin the Minimum Descent Atitude for the approach being flown until the runway environment is in sight and until descent is necessary to make a safe landing. Immediately execute a missed approach if the runway environment is not clearly visible at the Missed Approach Point if it is lost at any time thereafter. Make the initial missed approach turn toward the runway if visval contact is lost during the circle-to-land maneuver. Fly any required missed approoch procedure with the some precision used for an instrument approach. Cancel your IFR flight plan with ATC if VFR conditions are met and you elect to proceed VFR. Fly an instrument approach procedure unless all required approach aids are available, operating, and used. Descend below the Decision Height or Minimum Descent Altitude without the runway environment in sight. Attempt a circle-to-land maneuver at the straight-in landing Minimum Descent Altitude. Commence or continue descent for landing without the runway environment in sight. Deviate from the published istrument approach procedures unless you are in VFR conditions and you hove cancelled IFR with ATC.